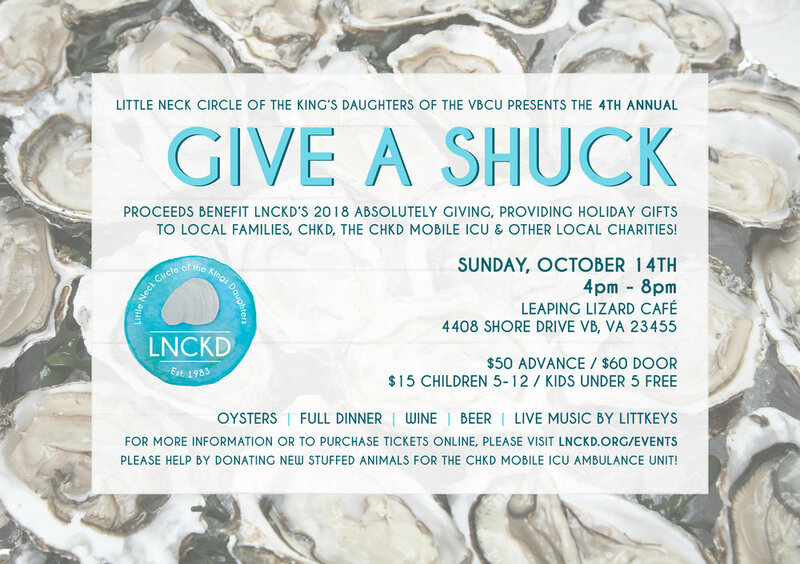 The Little Neck Circle of the King's Daughters of the VBCU is pleased to announce our 4th annual fundraising event, “Give A Shuck” Oyster Roast, on Sunday October 14, 2018! Online ticket sales are now open! Don’t wait, save by purchasing your 2018 Give a Shuck tickets in advance! 2018's event includes live music by the LittKeys, and as always - a full dinner and oysters provided by Leaping Lizard, wine, beer truck and much, much more! Proceeds will benefit LNCKD's 2018 Absolutely Giving, providing personally shopped-for, wrapped, and delivered holiday gifts to many local children who may otherwise go without, The Children’s Hospital for the King’s Daughters, the CHKD Mobile ICU and other very deserving organizations throughout Hampton Roads area! Please help by donating new stuffed animals for the CHKD Mobile ICU ambulance unit, there will be a collection set up at the entrance to the event. As we head into our 4th year with this event, we hope to go ABOVE AND BEYOND all previous year’s contributions! We can only do this with your help! This will promise to be another terrific fall event! Thank you for your support! Special thanks to all of our generous sponsors for this year’s event! The Little Neck Circle of the King's Daughters of the VBCU is pleased to announce our 3rd annual fundraising event, “Give A Shuck” Oyster Roast, on Sunday October 22nd! 2017's event includes live music by Bennett Wales, a full dinner and oysters provided by Leaping Lizard, wine, beer truck and much, much more! Proceeds will benefit LNCKD's 2017 Absolutely Giving, providing personally shopped-for, wrapped, and delivered holiday gifts to many local children who may otherwise go without, CHKD, the CHKD Mobile ICU and other deserving organizations throughout Hampton Roads area! Please help by donating new stuffed animals for the CHKD Mobile ICU ambulance unit, there will be a collection set up at the entrance to the event. As we head into our THIRD year with this event, we hope to go ABOVE AND BEYOND all previous year’s contributions! We can only do this with your help! Please join us on February 18th for an afternoon of fun, friends and pizza as we log miles to raise money for an amazing cause! The Pizza Chapel 5K Run/Walk is an event to support our fellow member, Laura Clark, in her campaign to become a 2017 "Win4Youth" Ambassador! As an Ambassador, Laura has the opportunity to represent the Adecco Group at the Gavà Triathlon near Sitges, Spain and further promote the Win4Youth Mission – to swim, bike or run to make a real, long-lasting difference in the lives of disadvantaged youth across the world. In a successful 2016 season, Adecco Group colleagues, clients and friends from across the globe came together to log over 4 MILLION kilometers matched with a global donation of over $400,000 to Win4Youth charities. For the 2017 Win4Youth initiative, six foundations have been selected in Finland, France, Japan, New Zealand, North America and the United Kingdom. The foundations will equally benefit from the funds raised by Win4Youth. *Donations are welcome for those who are unable to attend.